The aircraft at the time of departure was in an airworthy condition with no known technical malfunctions. There were no indications that either the CVR or FDR were altered. Both the CVR and FDR stopped recording at the same time. The last radio transmissions by the flight crew ended four seconds before the CVR and FDR stopped recording. The aircraft was on a constant speed, heading, and altitude when the FDR stopped recording. There were no indications of any technical or operation issue with the aircraft or the crew prior to the end of the CVR and FDR recordings. 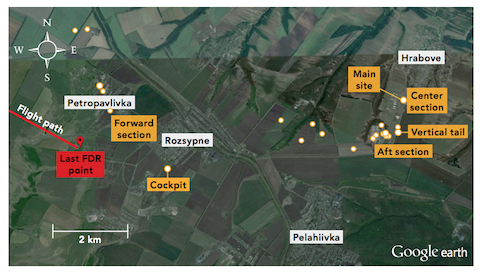 Three other commercial airliners, two 777s and an A330, were in the same general vicinity as flight MH17 at the time of the occurrence, with the closest aircraft about 30 km (18.6 miles) away. 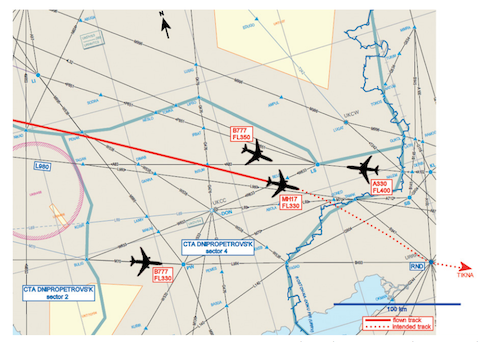 The aircraft experienced an inflight breakup, with the wreckage falling to the right of the projected flight path of the airliner. The penetration of the high velocity objects likely led to a loss of structural integrity, which in turn led to the inflight breakup. The cockpit was found about 2 km (1.25 miles) from the last position recorded by the FDR, and the main wreckage area about 8 km (5 miles) from the last recorded postion. Damage in the cockpit area and forward fuselage was consistent with multiple high velocity projectiles penetrating the aircraft, with the source of those projectiles being above and outside of the aircraft. The pattern of damage to the cockpit and forward fuselage was not consistent with the damage expected from any known failure mode of the aircraft, its engines, or systems. While it has been widely reported, both by the media and by a number of governments, that the aircraft was shot down by a surface to air missile, the Dutch Safety Board did not directly discuss the source of the high velocity projectiles that hit the aircraft. Also not mentioned in this preliminary report were the result of any forensic examinations of the passengers and crew members, or of any of the wreckage found on the site. Another key area not examined was how the government of Ukraine managed flight safety over a region of active military conflict. The Dutch Safety Board did not give a timetable for completing the final report, but given that the preliminary report stated that the wreckage should be examined further, this implies that the final report will be published only after the investigators regain access to the areas where the wreckage fell. At the time of the preliminary report was published, that area was still part of an active conflict zone. Labels: airlines, malaysia, mh17, missile, plane crash.